Glory, glory, it's the day Star Wars fans have been waiting for all year. No, there's not a new Last Jedi trailer. Not yet anyway. It's May 4th, known worldwide as international Star Wars Day. And to celebrate, Jimmy Fallen and his Tonight Show crew threw together an infectious mashup music video that you'll find impossible to resist. The Tonight Show premiered the catchy mashup during last night's broadcast. Simply called 'Star Wars Characters Sing All Star' on Jimmy Fallon's Youtube Channel, this barrage of clips became an overnight viral sensation. The Tonight Show staff offered this quick description of their masterwork. 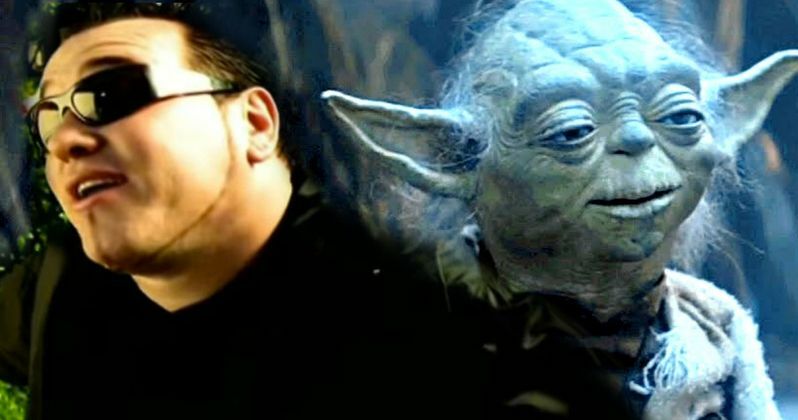 "In honor of May the Fourth, Jimmy re-edits footage from the Star Wars films to make the characters sing "All Star" by Smash Mouth." The Star Wars All-Star video was actually a fan wish sent into Jimmy Fallon from an audience member. And as you can see, Jimmy's staff made it happen in quite glorious fashion. All in the name of 'May the Fourth Be With You'. The video features characters from all 8 live-action Star Wars movies. Featured are a variety of familiar faces that inlcude Yoda, Luke Skywalker, Supreme Leader Snoke, Princess Leia, Han Solo, Chewbacca, R2-D2, C-3PO, Maz Kanata, Jar Jar Binks, Qui Gon Jinn, Anakin Skywalker, Kylo Ren, Watto, Poe Dameron, Gold Leader, Rey, Boss Nass, Admiral Ackbar, Finn, K-2SO, even a Tauntaun and a whole lot more. It's a lot of Star Wars in your face and presented in such a way you won't be able to get it out of your head for the rest of the day. What started as pun warmly shared by fans has become a full-fledged Star Wars holiday. Star Wars Day, which happens on May 4th, is a special once-a-year celebration of the galaxy far, far away. One of the earliest known records of "May the 4th" used in popular culture is in 1979, as described here by author Alan Arnold while he was chronicling the making of The Empire Strikes Back for Lucasfilm. "Margaret Thatcher has won the election and become Britain's first woman prime minister. To celebrate their victory her party took a half page of advertising space in the London Evening News. This message, referring to the day of victory, was 'May the Fourth Be With You, Maggie. Congratulations,' further proof of the extent to which Star Wars has influenced us all." Once the Internet allowed Star Wars fans around the world to connect with one another, May the 4th soon became a grassroots tradition each year, with fans online and offline proclaiming it "Star Wars Day." Ultimately, as Star Wars Day was created by the fans, it is truly their day. Hosting movie marathons, sharing greetings on social media, cooking Star Wars recipes -- there are no wrong ways to celebrate May the 4th, and each year we're amazed at the creative ways that fans mark the occasion. With Star Wars alive like never before, we hope you'll join in this year. May the 4th be with you. Enjoy Jimmy's video.